Catalyst is a little different than most wood stoves. While your Catalyst will begin to run as soon as you load your first piece of wood, to get the most out of your Catalyst you will need to use our wood stove smartphone app. This How To guide walks you step by step through how to use your Catalyst app to control your Catalyst wood burning stove. Before you start using our wood stove smartphone app, the first step is to make sure your Catalyst is installed properly. Please refer to the Catalyst Owner’s Manual for all information regarding installation. Once Catalyst is set up, all you need to do is plug it in. Catalyst plugs into any standard North American wall outlet (120V AC). Catalyst’s combustion fan (the fan in your chimney pipe) plugs into the top power slot on the smart controller, directly beneath the power cord. Catalyst’s blower fan (located on the back of the stove near the base) plugs into the lower slot. There are also 3 sensor cables that should be plugged into the back of the stove. For more information see the Owner’s Manual. After Catalyst has been plugged in it will go through it’s start-up routine. This routine lasts approximately 30 seconds during which both of Catalyst’s button lights will flash alternately. Following start-up, you are ready to connect to your stove. But first, let’s get our wood stove smartphone app. Catalyst app can be downloaded from the Apple, Android and Amazon app stores by following the links below. Alternately, just search for “MF Fire Catalyst” in any of the app stores. The first time you open our wood stove smartphone app, you will be asked to register by entering your name, email, and stove serial number (found on the sticker on the bottom, back right of the stove). Registering your stove helps MF Fire to work with you through troubleshooting, should the need ever arrive. You should only need to register your stove once, but you may be prompted to re-enter information after an app update or a prolonged period without using the app. The serial number is a 6 digit number located on the UL sticker on the back of your stove. After registering your stove, the Catalyst app will take you to a screen that says “Scanning” or “Found Devices”. If this screen does not automatically pop up, click the bluetooth icon ( ) in the upper right corner of the app or select connect from the options menu. If you do not yet have bluetooth enabled on your devices, you will be prompted to turn it on. After scanning for local bluetooth devices, a device labeled “MF Fire” should pop up. First, be sure to select “Always connect to the selected device”. Next, click on the word “MF Fire” and you will be taken to the control screen. Having trouble connecting? Try restarting your app by completely closing the app, and then re-opening it. If you are still having trouble connecting, you should power cycle Catalyst’s control board. Simply unplug the board, wait 60 seconds, and plug it back in. Then, repeat Step 4. Note: Only one device can be connected to Catalyst at any time. The room temperature wheel, which sets your desired room temperature. The room blower slider, which adjusts blower speed. And the power on / power off button, which turns the stove off or on. Additionally, the control screen shows the current stove mode. To set your temperature, simply drag the temperature wheel to your desired room temperature. Catalyst will detect your current room temperature and adjust the burn rate to heat your home effectively. Alternately, by sliding the wheel all the way to the right or all the way to the left you can turn the stove to it’s “Lo” or “Hi”, respectively. The room blower blows air over the top of your stove and into your room. Simply slide the bar to the left to turn the blower down or to the right to turn the blower up. The blower can also be adjusted with the blower button on the controller box itself, located behind the stove, which cycles High > Medium > Low > Off. Note: To conserve power the blower does not run when the stove is in “Off mode”. If the blower is not running, press the restart button. The On/Off button will turn the stove off, if in normal operation, or send the stove back to the five minute start-up mode if the stove is off. Check in on the status of your burn on the status screen. From the main screen click the status tab. The status screen shows you the current room temperature, fire temperature, burn rate, burn status, and efficiency! Note: No status screen numbers will display if there is no fire or the fire is too small in Catalyst. The Catalyst app will notify you of several events during your fire. “Five Minute Start-up Mode” – the Catalyst app will let you know when your five minute start-up mode begins. You can enter this mode by pushing the power button on your smart controller or by pushing the power on button on your Catalyst app. While in start-up mode, your combustion fan will run on high to deliver essential air to the fire. “Boost Mode Activated” – If Catalyst detects your fire is dying, it will speed up the combustion fan to rekindle the fire. Boost mode might occur when the fire is just getting started, or when the fire is about to die out. If you want to keep burning, this is typically an excellent time to reload. “Over Fire Detected” – Over firing occurs when a fire in the wood stove grows too hot. This overheating can cause damage to your wood stove and even cause chimney fires. If your stove begins to over fire, Catalyst will automatically shut down airflow to prevent damage. Do not open the stove door during over fire. If an over fire event is detected, reduce the wood loaded in future burns. Check your bluetooth settings. Make sure your device has bluetooth enabled. Catalyst relies on bluetooth to communicate with your device. Restart the app. Occasionally, the Catalyst app may get hung up. Try closing the app entirely (not just going to the home screen) and restarting it. Restarting your Catalyst. If you are still having trouble connecting, you should power cycle Catalyst’s control board. Simply unplug the board by pulling the wall plug out, wait 60 seconds, and plug it back in. For many wood stove users, efficiency and saving money are the biggest reasons they switched to heating with a wood burning stove. If you heat your home with wood, you can save big-time. In fact, typical wood stove users spend only half as much on winter heating as homeowners who heat with propane, fuel oil, or electric baseboards. But traditional wood stoves aren’t perfectly efficient. Catalyst, MF Fire’s efficient wood burning stove has a smart efficiency of 90%, meaning our customers use less fuel and save on home heating every winter. Do you want to learn how to save money on heating, or exactly how much you can save if you heat your home with wood? We ran the numbers to show you. According to Efficiency Maine, “high-efficiency and low-particulate wood stoves are a renewable and cost-effective way to heat your home.” We used their home heating cost comparison tool to compare 8 different home heating systems, including EPA certified wood stoves, pellet stoves, and MF Fire’s Catalyst efficient wood burning stove. For a 1,500 sq. ft. home in a climate with moderate winters, it will cost only about $1,150 per year to heat the home with a Catalyst wood stove. That is a $350 annual savings over an EPA certified wood stove, an $800 annual savings over a pellet stove, and a $2,500 savings over a propane furnace. That means over the lifetime of typical wood stoves, Catalyst can save you over $8,500 on your winter heating bill. The Catalyst is one of the best wood stoves for the money because it can save you thousands of dollars per winter on heating. Of course, not everyone lives in a 1,500 sq. ft. house. Want to covert our winter home heating to find out how much you’d save on home heating? Just use our home type table below. Simply multiply the costs of any heat source by the multiplier for your home. For example, heating with a pellet stove in a 2,000 sq. ft. home with severe winters costs $1,987 x 2.0 = $3,974 per year. Our pellet stove user switching to a Catalyst wood stove would save $1,600 each year! We think that’s a no-brainer. Have any more questions on how to save money on heating, or on how to heat your home with wood? Just email us at info@mffire.com. Want to learn more about what makes Catalyst so efficient? Check out our blog on smart efficiency here and learn how much you could save on home heating. How do you make a clean wood burning stove? Swirl it. A roaring fire is great – except for all of the smoke and the soot. But did you know that changing the shape of the flames in a fire can make it cleaner? When you swirl the flames, like we do in our Catalyst clean wood burning stoves, there is less smoke and less soot. It’s one big reason Catalyst is so much cleaner than traditional wood stoves. Check out a video of our fire vortices below, and then read on to learn more about wood smoke and how Catalyst gets rid of all the pesky pollutants and health issues traditional wood stoves have to deal with. We’d say that, with our stove, those problems go up in a puff of smoke, but then we’d be lying. It’s more like they get lost in the vortex. Over time, as any wood burner can tell you, wood smoke from wood burning stoves get on everything: your walls, furniture, clothes, house and car. Even more importantly, wood smoke inhalation can also lead to health issues. In some parts of the country it is a leading cause of lung disease, asthma, and respiratory illness. Catalyst is the first smart stove, delivering an efficient, clean, and safe fire. Wood burning stoves don’t need to be dirty though. With the latest advancements in combustion science and engineering, it is possible to have a wood fire without all of the smoke. Catalyst is MF Fire’s clean wood burning stove, winning the MIT Clean Energy Prize and back-to-back low emissions prizes versus the industry’s best at the Wood Stove Decathlon and and Next Generation Wood Stove Design Challenge. MF Fire solves the issue that make wood stoves dirty by making clean wood burning stoves that are virtually smoke and soot-free. To help protect against these emissions, the U.S. Environmental Protection Agency released rules limiting particulate emissions of wood stoves sold after January 1, 2020 to just 2.0 grams per hour, or more than ten times less than the 15 to 40 grams per hour that an older wood burning stoves can emit. Almost no existing wood stoves stand up to these new health standards – but MF Fire’s Catalyst does. The Catalyst clean wood burning stove was one of the first wood stoves that went through the EPA’s new rigorous test method, and one of the only stoves that beat the new 2020 emission standards. How does MF Fire make our clean wood burning stoves? To understand we have to learn a little bit more about smoke and fire. Fire is a chemical reaction, where oxygen from the air reacts with fuel to produce carbon dioxide, water, and heat. But wood can be difficult to burn. Wood is primarily made up of the molecules cellulose, hemicellulose and lignin. These molecules are long chains of carbon and hydrogen atoms. To burn completely, these long chains must break completely apart, which can be difficult to do. If they don’t break apart, the fire produces what are called “products of incomplete combustion”. These products of incomplete combustion are what make up smoke. There are a wide variety of chemicals found in smoke, including carbon monoxide,volatile organic compounds, toxics, and small globs of carbon called soot or particulate matter. Particulate matter is of particular concern. Particulate matter with diameters under 2.5µm (PM2.5) are hazardous to human health in high concentrations. This is because these small particles can work their way through the sensitive membranes of the lungs when inhaled. This particulate matter mixed in with the hot gases of the fire is what makes smoke visible and dangerous. How is Catalyst a clean wood burning stove? Catalyst is the first smart stove, delivering an efficient, clean, and safe fire. Catalyst burns cleaner than other wood stoves because it uses a carefully controlled secondary combustion system. Secondary combustion introduces additional air above the main flames. Secondary combustion is used to “burn off” the smoke produced by the initial wood fire, eliminating the products of incomplete combustion. Catalyst’s smart controller carefully monitors this secondary combustion, constantly adjusting to maintain the fire in the sweet spot. The video above shows a small flame swirling in the secondary combustion area of the stove. The fire in a wood stove is an example of a diffusion flame, meaning that the smoke and the oxygen from the air need to mix together to burn. To burn as much of the smoke as possible, these gases need to be as well mixed as possible. One great way of doing that is by introducing swirl, as shown in the video above. In our Catalyst wood burning stoves, the secondary combustion system makes swirling vortices, that you can see here. As a vortex spins, it stirs off leftover fuel from the primary burn and the new oxygen that we’re adding, mixing them together, and burning off any leftover particulate matter so the exhaust gases from the stove are as clean as possible. Catalyst is a clean wood burning stove that allows you to freely enjoy the warmth and comfort of your fire. To learn more about Catalyst, click here. A few years back I had a pretty typical wood burning stove. My wife and I loved the fire, we loved burning wood, but boy was it a pain to start. Our old wood stove was impossible to start and filled the room with smoke. Sound familiar? In our old wood stove, a brand that shall not be named, getting a fire going felt like a secret ritual. Open the bypass and the damper. Make a careful cradle with kindling and copious amounts of newspaper. Strike a match to light the newspaper. Shut the door halfway and back up rubbing your eyes because smoke is now filling the room. The fire goes out leaving half of the newspaper unburned. Strike another match and try again. Add more newspaper and kindling. Crack the door a little wider. Finally get a fire going, shut the door, and come back ten minutes later to realize the fire has gone out again. Give up and use a propane blowtorch to light every last piece of wood. Latch the door a full hour after you started. We liked fire enough to go through this ritual almost every winter morning. It wasn’t fun spending an hour on my knees with watering eyes, poking and prodding a fire in a cold house—all before coffee. I knew that there had to be a better way. Catalyst, MF Fire’s smart wood burning stove, is that better way. With the Catalyst wood stove all you need to do is Load it, Light it, and Lock itTM. From there, our smart burning technology takes over and you can enjoy a beautiful fire in only three minutes. In our video below I build a fire in Catalyst to show you how easy it is. The problem with traditional wood stoves is airflow. In the early stages of burning the fire needs a lot of air to keep the fire going. But in a typical wood stove, you need a big fire before the stove starts to draft well – to really pull air through the fire. For the fire to get enough airflow in those early stages you need to have the damper all the way open and usually keep the door open too. But letting fire burn like this is dangerous and the leading cause of the 22,000 chimney fires in the U.S.A. each year. With Catalyst, we’ve fixed this problem by directly controlling airflow. Catalyst is the first wood stove that can be controlled with your smart phone or tablet. Catalyst is an automated wood stove, eliminating the need for you to constantly adjust to achieve an ideal flame. We do this by using our patent pending TurboStartTM turbofan to drive airflow throughout the stove when and where it is needed. When you open the door to build a fire in Catalyst, our smart sensors sense that you are about to build a fire. The turbo fan kicks on to deliver air to your growing flame and to keep smoke inside the stove, instead of filling your room. As the fire grows, Catalyst watches carefully, adjusting the airflow as needed and working to heat your home to the room temperature as set by our Catalyst smart app. Even better, Catalyst’s automation helps you get the most out of every fire boasting a smart efficiency of 90%. Building a fire in a wood stove shouldn’t be hard. With Catalyst, it isn’t. To learn more about the Catalyst automated wood stove click here or subscribe to our newsletter for more updates. What Makes a Smart Wood Stove? The word smart is thrown around a lot lately – smart cars, smart phones, smart homes. Even a few wood stoves claim to be “smart”. These stoves essentially all do the same thing. A smart stove uses simple tactics to open and close a single opening at a fixed temperature. This can be nice feature, but it isn’t much smarter than an egg timer. To truly be a smart wood stove, the wood stove can’t just repeat the same pre-programmed steps over and over again. To truly be a smart wood stove the wood stove has to learn. Computers that learn, instead of just act, have been a hot topic recently. Machine learning is the process of getting computers to adapt to improve their own behavior. In the past decade, machine learning has led to self-driving cars, better medicine, and even improved TV watching (thanks Netflix!) This growth is because machine learning is particularly good at handling complex problems, problems with a lot of data or where a person’s individual circumstances are very important. A smart car can’t just drive, it needs to drive on the road you are currently on and in the traffic you are currently in. You don’t want to waste time watching a random show, you want to enjoy watching your next favorite show. As it turns out, a wood fire is a perfect example of this sort of complex problem. Every wood stove is connected to a different chimney system, leading to different drafts on different days. Every user uses different fuel, different types of wood, in various conditions, of varying sizes and each and every person builds their fire differently. Perhaps most importantly, everyone is heating a different home and everyone has their own ideal heat. With all this complexity it’s impossible for a traditional wood stove to meet every user’s needs. Instead wood stove manufacturers design their stoves to do well in laboratory testing, and not the real world that we all live in. As a result, traditional wood stoves are hard to start, consistently over or under-heat room, and always emit more smoke in the real world than in the test lab. Catalyst is the world’s first smart wood stove. These problems are why we at MF Fire decided to do things differently. Catalyst is the first truly smart wood stove, the first wood burning stove to use machine learning to improve performance. Catalyst’s smart controller is continuously monitoring both the fire and your room, watching and learning exactly how your fire burns in your home. This smart stove is actively adapting to the changing conditions of your fire. How do we do it? We began by measuring every detail of thousands of fires. We used this information to map out what we call the perfect burn. The perfect burn is a beautiful fire with no smoke, no soot, and no hassle. We designed Catalyst with this data built in, and Catalyst’s smart controller is constantly working to achieve this perfect burn. But that isn’t all. Catalyst also learns what your perfect fire looks like. How does your fuel burn? How is your draft? How hot do you like your room and how much heat does it take to get there? The more you burn, the more Catalyst learns, adjusting to optimize and improve your experience. What does this mean for you? Better efficiency and emissions in the real world, not just the test lab, and a safe and beautiful fire in your smart stove every time. That’s what makes a smart wood stove. If you’re ready to start burning smarter then order your Catalyst smart stove today. One of my favorite winter activities is building a fire. I love setting the logs, stoking the flames, and settling in for quality family time around it. This is nothing new. Fires have been a center piece of family life since we blocked the cave entrance with a fire at night for safety to ward off predators. This pleasure has always come with a certain level of risk. Even a modern safe wood stove creates risk of chimney fires and house fires. We accepted this risk rather than give up fire – there was no other alternative. Fortunately, new advanced wood stove safety features from MF Fire™ remove fire risks seen in all other wood stoves. Let’s go over these key wood stove safety risks and explore what has been developed to make a safe wood stove. Even the most experienced wood stove users over-fire their stoves. Over-firing occurs when too much wood is loaded and provided with too much oxygen, frequently when the catalytic combustor is bypassed and the flue damper is left open. It can happen when we are distracted, juggling too many activities at once or when we are cold and tired. Over-firing can compromise your wood stove safety by damaging your stove, weakening and warping its metal. The extra hot gas vented from an over-fired stove can, in turn, ignite the creosote buildup in your chimney and cause a chimney fire – the most dangerous situation for any wood stove owner. This occurs more than 22,000 times a year in the United States and is a leading cause of house fires. Preventing over-firing is possible with MF Fire’s advanced safety system built around its stove automation and smart controller. Traditional stoves are manual at all phases of use and there is no way to detect when over-firing is occurring. MF Fire changes this. In Catalyst™, we added automation and monitoring to create a smart wood stove. Real-time monitoring inside the wood stove detects when over-firing is about to occur triggering the stove to automatically regulate the fire back to a safe level. The Catalyst Smart App also notifies the owner with a simple alert of the event. This advanced system is the only solution on the market that proactively prevents chimney fires and over-firing, protecting your household and ensuring continued safe wood stove use. When you leave open door of a wood stove, there is an opportunity for an ember or shifting log to escape and start a room fire. This happens at startup when people often leave the door open to help deliver a faster start, when hot loading, or when the latch isn’t closed properly. Catalyst’s technology advances make for a safe wood stove by minimizing the risk of an open door. A cold startup is notoriously difficult for even an experienced wood stove user. Due to chimney draft problems, the door is often left open to provide maximum oxygen to the fire and air is drawn into the fire box as newly heated air rises. The problem is mother nature has a column of heavier cold air pressing down against the hot air. This in turn forces smoke and other particles, including embers, out into the room. Speeding this process has a big impact on open-door safety. MF Fire introduced Load it, Light it, Lock it™ technology to minimize this effort and to minimize open-door time. Catalyst’s TurboStart™ fan forces air into the firebox to speed combustion without having to keep the door open, securing against this type of risk. When the stove door is accidentally left open during a start, reload or by a younger member of the household, the sooner you know about it the safer your home and family will be. One safety innovation that proactively addresses this scenario is the open-door alert. The Catalyst Smart App has wood stove safety features, including a built-in alarm that will alert an owner that a door has been left ajar, enabling the door to be secured quickly and safely. If you are using an older wood stove, but are considering upgrading your stove, demand a safe wood stove. Catalyst wood stove safety benefits allow you to comfortably and safely get the most out of your stove experience. Source: Chimney Safety Institute of America and the US Product Safety Commission. There are lots of ways to save money on energy. You can upgrade to new light bulbs, buy more efficient appliances, or unplug your gadgets when you leave the room. But none of these savings compare to the money you spend on heating your home and the money you could save by switching to a high efficiency wood stove. A little less than half of America’s residential energy consumption goes to home heating and it’s a good bet that your money is going up in smoke without an energy efficient wood stove. Catalyst lets you set and maintain your ideal temperature, never over or under heating the space. Many wood stove users I have talked to stressed that saving money is a part of why they switched to wood heating. That’s no real surprise. A typical wood stove user can spend half as much on heating as users of heating oil, propane, or electricity. But that isn’t to say a traditional wood stove is an energy efficient wood stove. In laboratory testing, older wood stoves rarely earn marks above 50%. That means that in carefully controlled conditions, half of the wood’s energy goes up in smoke. In the real world the situation is even worse. Without an incredibly experienced user and constant adjusting, traditional wood stoves tend to overheat rooms, wasting wood and making you less comfortable. Catalyst does something a little different. Unlike traditional wood stoves, Catalyst lets you set your room temperature with the Catalyst Smart App, and then works to maintain it. Even better, Catalyst is constantly learning using smart stove technology. Because no two homes are alike, we built the Catalyst Smart App to learn from your previous burns and adjust itself to better maintain your ideal temperature. As a result, Catalyst is a high efficiency wood stove. No wood is wasted on heat you don’t need, and you stay comfortable. Research on similar thermostats for other heat sources estimate that switching to a programmable thermostat can provide up to a 30% energy savings over more manual control methods. Learning thermostats, like the Catalyst Smart App, do even better, providing additional gains of about 20% over their non-learning counterparts. The Catalyst has the ability to get every bit of energy out of every piece of wood using smart stove technology, which is why the Catalyst is truly a high efficiency wood stove. Catalyst is the world’s first smart efficient wood burning stove. What does that mean for you? With Catalyst’s impressive laboratory efficiency of 70%, and an estimated smart efficiency saving of an additional 20%, Catalyst uses only about half as much wood as a traditional wood stove. Even when compared to other top energy efficient wood stoves, Catalyst uses smart stove technology to help you use 20% less wood each winter. For a typical wood stove user, that amounts to savings of between $160 and $400 each and every year. If you want to save hundreds of dollars a year on wood and get the maximum comfort from your stove, check out our Catalyst smart, energy efficient wood stove today. We think that’s pretty smart and a lot more fun than swapping out that light bulb. If you like this article about our energy efficient wood stove, be sure to click our like button below and share with your friends on Facebook. Taylor Myers is the CTO of MF Fire. Why do I want a wood burning stove with an app? Ahhh, the joys of a good fire. Crackling, glowing logs providing comfy warmth. Snuggling down with my family on a cold winter’s night. Opening the app on my phone … wait! An app? Why would I want a wood burning stove with an app? On the surface, an app might seem like an unusual thing to associate with a wood burning stove. But if you dig deeper you can see significant new value and benefit of using a wood burning stove with an app. Before we look at these benefits, let’s step back for a moment and look at some of the challenges of wood stove use. In a traditional wood burning stove, substantial effort is required to start a fire. A cold start is a frustrating and effort-filled process, one that may cause you to dread using your stove. Once started, keeping your room temperature at a comfortable level is a constant challenge. Constant challenge – hopping up to adjust the damper, opening windows and shedding layers – all to try and maintain your ideal temperature. Throughout the day and night, you load the logs. Traditional wood stoves burn inefficiently, resulting in additional chopping, stacking and hauling. At MF Fire, we wanted to solve these challenges, so we designed our Catalyst smart wood stove from the ground up to be the best wood burning stove with an app. Catalyst features a forced air design that maximizes airflow during startup resulting in the easiest and fastest cold start in the business. Load it, light it and lock it. Perfect Burn™ smart wood stove technology automatically adjusts your fire thousands of times a second to constantly deliver your ideal temperature. All while maximizing your wood’s heat potential for longer burn times and reduced wood use – no more extra trips to get more wood. Now, startup is easy, heat output is constant and just right, and the burn is long lasting and efficient. With the Catalyst Smart App, Catalyst can customize its settings just for you. Set your ideal temperature and our smart wood stove does all the work to maintain that temperature. Decide you want it warmer? Crank up the temperature at the touch of a button – no more frustration messing with a damper to try and get it right. Want more heat spread across your room or house? Turn up the blower by sliding your finger across the screen. And since your fire will last far longer, the app will notify you when your fire needs more wood at just the right time so you can comfortably know your fire will burn uninterrupted through the night. What other benefits do you get by having your very own fire app? You get a whole new range of safety and use information. For example, your app will notify you when the stove door is left ajar, or that your stove is over firing. You can also see information about your stove use and personal health benefits from using your ultra-clean smart wood stove. Why buy a wood burning stove with an app? Convenience, control, and comfort. I bet they have an app for that. Paul LaPorte is CEO of MF Fire. MF Fire operations were recently featured in our own local news in this excellent video article by WHAG. WHAG’s Nina Kapur paid a visit to our manufacturing facility in Smithsburg, MD to see a Catalyst test unit in operation. We’re proud to be 100% made in the U.S.A. and excited to be a part of bringing manufacturing back to the state of Maryland. Catalyst is available for pre-0rder today. Be sure to get your wood burning heater before time runs out. Could accelerate its business through the buzz surrounding an equity crowdfunding campaign. Go check out the article at EarlyInvesting.com. If you haven’t already, join our newsletter, and we promise you’ll be the first to know when we open up for crowd funding. Our beta-testing is well underway and we are incredibly excited to share some of the first footage from The Perfect Burn testing! Watch our new video here. We’d love to know what you think of the new look and the new fire in our clean-burning wood stove! More exciting news, this time in a new article by Fast Company! Author Adele Peters talks about how the ultra-clean Mulciber can make a big difference in the rapidly growing wood heating market. Peters first explains the experience of a typical San Francisco resident. He or she will not be allowed to warm a living space by cozy fireplace or wood burning stove because of the classic issues: the soot is messy and dangerous, the temperature is difficult to regulate, the air pollution causes asthma. In other words, MF Fire makes efficient wood stoves that are a more environmentally friendly source of heat than the coal or gas-powered alternatives. There is no soot at all and virtually no smoke, making these efficient wood stoves perfect for a city dweller, where wood is a growing fuel source for heat. We are thankful for the opportunity to be featured in Fast Company, and we plan to continue working towards market-ready efficient wood stoves available to all consumers. If you like this article please share it with your friends. We need your help to get the word out. And make sure to stay tuned for additional updates from MF Fire! How can you save the planet? Smithsonian Magazine thinks the ultra-clean Catalyst contemporary wood stove (previously named Mulciber) definitely helps. Rachel Kaufman, writing for Smithsonian Magazine, thinks that modern wood stoves might be part of the solution to foreign fossil fuels, but only if it is clean. The Catalyst wood stove brings wood burning technology into the future. Not only does Catalyst reduce emissions, but it also reduces wood consumption due to its smart efficiency. Head over to the Catalyst product page to learn more about our contemporary wood stove and order yours today. We hope everyone had a great 2015! As the year came to a close the MF Fire team was hard at work testing our brand new Mulciber smart electric stove. Early tests show super fast start-up, incredibly clean burning, and a beautiful full fire view.We put together a quick video for you during one of our tests here. We would love to hear your feedback and if you like the video please share with anyone else who would enjoy it. We have more footage of our Mulciber in action on the way. We’re also seeking additional funding for our smart electric stove in 2016. MF Fire is polishing up our business plan, and we expect to gain more investors through crowdfunding & VC funding. If you know anyone seeking a great business to support, please share MF Fire with him or her. We will have a lot more news in the next few weeks! Also, check out below for a recap of the exciting year we just finished. We spent the first half of the year building upon our competition success & developing the prototype into an actual consumer-ready wood burning stove. If you haven’t heard, we won the MIT Clean Energy Award for Energy Efficiency, Grand Prize in the Wood Stove Design Competition, Final Four of the ACC Clean Energy Challenge, and a few more. We learned a lot in 2014 that we used to further engineer the Mulciber smart electric stove in 2015. We launched the first Mulciber (now renamed the Catalyst Wood Burning Stove), and we were thankful that demand outstripped supply for testing. We’ve used the feedback from our testers over the last year to improve our model, and we’re preparing it for production & sale in 2016. If you didn’t get to test, stay tuned – we plan to have units available this summer. Our alma mater stopped by to ask us about our success. The University of Maryland Diamondback newspaper featured MF Fire, sharing how we went from students to engineering challengers to a stand alone company. And of course, our source of energy: “What sets us apart is that we are the first wood stove company that is really interested in helping people to live a natural and sustainable lifestyle,” Myers said. 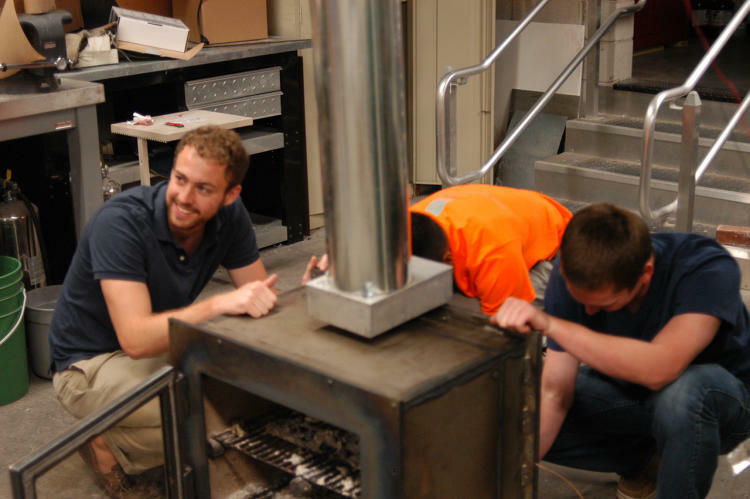 Since the article was written, the University of Maryland Alumni have launched MF Fire and built an EPA-compliant wood stove, the Catalyst Wood Burning Stove. Wood Stove 101: The perfect way to build a fire, top-down. What Is Inside a Candle Flame?